One of the more challenging aspects of my job has been introducing new digital art programs. When I started teaching 4 years ago, I was literally one day ahead of the students. Not only that, but I would also be teaching the Adobe Illustrator (or Photoshop) program and constantly have to stop to help students with technical difficulties. I felt like a chicken with my head cut off for the better part of an hour whenever I had to introduce the Adobe programs to students. I found myself dreading teaching new techniques in any digital platform. This is no longer the case today. I don't credit myself as an expert; there are still aspects of all the digital programs I use that I continue to tweak and change year by year. However, I have found something that I think you will find truly helpful, especially if you are just starting out. In that first year, there was one thing that became obvious to me: YouTube had become my best friend. I truly do not know how anybody taught without it. There is a YouTube video out there for everything! The tough part is finding the right YouTube video. After a few years of muddling through the internet, I finally decided to make my own instructional videos. This decision became a necessity when I was preparing for maternity leave and found that there were no ready made videos that taught exactly what I wanted to teach. I wanted a video series that would teach not only the Adobe Illustrator (and eventually Photoshop) program, but also taught the fundamentals of design, or the elements of design. I soon found that the students not only responded better to this method of teaching, but they actually enjoyed the learning process. With these videos, I could introduce to the topic, have a short discussion with the students, and then let them loose on the series. This meant I was free to roam around the room and answer questions as they arose, instead of making the whole class wait for one or two students who were having issues. Students could work at their own pace and they learned the material much more readily. I am working to make this series available to you. FOR FREE. I want your feedback. I want to know what you like, what you don't like, what you think should change. At the beginning of November, I will have a FREE Adobe Illustrator video series. In this series, I will be teaching how to use the Adobe Illustrator program and use the elements of design. This is unique to anything that I have found online. Click the link below to sign up for my email list to be informed of the release of my FREE video series. Read more about Adobe Illustrator...scary or fun? A few weeks back, I wrote a post on "Using Sketchbook to Balance Digital and Physical Art”. 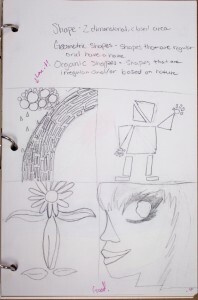 Mostly I wrote about how to use the sketchbook as a spring board to creating art or publications in computer graphic design classes. In the coming weeks I will be discussing the use Adobe Illustrator to help students learn the elements of design. As students travel through the Adobe Illustrator journey, I want them to find visual examples of the terms we discuss in class. 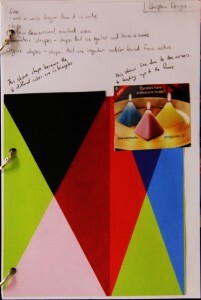 This is ANOTHER OPTION for introducing the elements of art through the sketchbook which I discussed in my “Elements of Art and the Sketchbook” post. 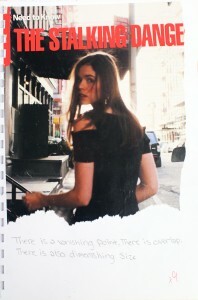 Basically, I have them find visual examples of each element from magazines and paste them into their sketchbooks. Then, they briefly describe how they know that an element has been used. I feel that it is just as important to teach them how to SEE the elements of design, as it is to USE them in their own designs. Too many times I find myself just letting them work on their own art and they lose the opportunity to learn how to see! This cut and paste option may not allow the students to show their creativity, but it does allow them to recognize good design when they see it. And I believe that is a very valuable trait in a budding designer. Do you do anything like this in your classroom? Comment below and share your thoughts. However, being that I teach at a public high school, I know that will never be the case. 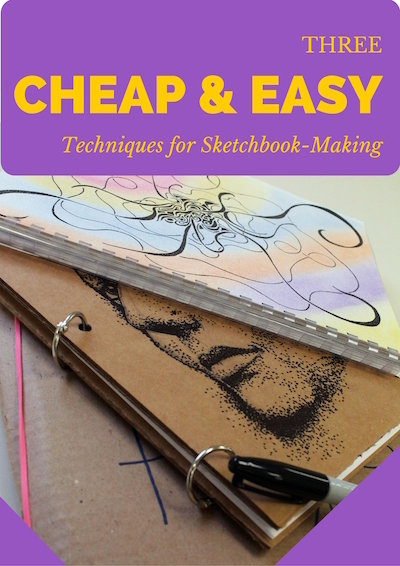 So as per my experience over the last four years I have come up with some tips to using the sketchbook as a tool, but also having assignments that the kids are, for the most part, willing to do and some even enjoy doing. Keep on a schedule. This is something that I have always tried to do, but have not always been successful. I try to give the sketchbook assignments on Tuesdays to be turned in the following Monday so that they have the whole weekend to work on it if they wish. By doing it every single week, the kids are never surprised by the due date and they can always assume that they will have something to turn in every week. Do (at least some) of the assignments with the students and have several examples (either yours or a previous student's example). Nobody knows better than a teacher that there is really no time to be spared. Somehow there always seems to be something to do. 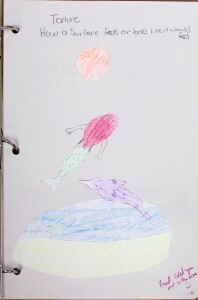 However, by completing a sketchbook assignment with the students, they somehow feel that you are not doing something unpleasant to them, rather, you are giving them something worth doing. Give them some class time to work on it. In my first few years of teaching, I thought that the sketchbook assignments should be done outside of class because I needed to give them homework. Most of the time, they do need to work on it at home, but by giving them time to work on it in class, they at least have a start on the assignment, and they know exactly what you want them to do. What you don’t want to do is give them a five minute description of what you want them to do at the end of the hour and expect them to complete it the way you want it done. That just doesn’t work. Don’t expect the kids to do every assignment. Unfortunately, I have found not all students love art. Some of them are there for an easy A and some of them are there for the course requirement. Don’t give up on them, but keep encouraging them to do the assignment. But whatever you do, don’t have pity and extend the due date. You know the saying, “Give a mouse a cookie, and he’ll ask for a glass of milk." Don’t give up! 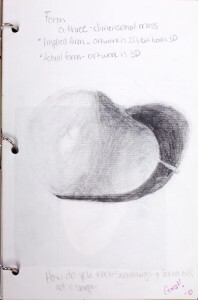 I believe that the sketchbook is an essential part of the art teacher’s arsenal. It allows students to explore their skills and allows the teacher to hone skills as they complete projects given them. I love the sketchbook, and I love seeing what the students can come up with the prompts I give them. I wish that they would all develop a love for sketching out their thoughts and that they would desire to create something new and exciting, but I have to settle for what I can get. Some will, some won’t. I just need to be consistent and do what I can to inspire those who will be inspired and not give up on those who will not. If you find these tips helpful, or if you have some to add, leave a comment below and let me know! I have been toying with the idea of making a planner to help my organize my life. There are so many things that scream for my attention everyday (both at school and at home) that sometimes I feel like a gerbal in an exercise ball. Going fast, but going nowhere! I have looked at dozens of planners and have not yet found what I am looking for. So I thought, "Why not make my own?" 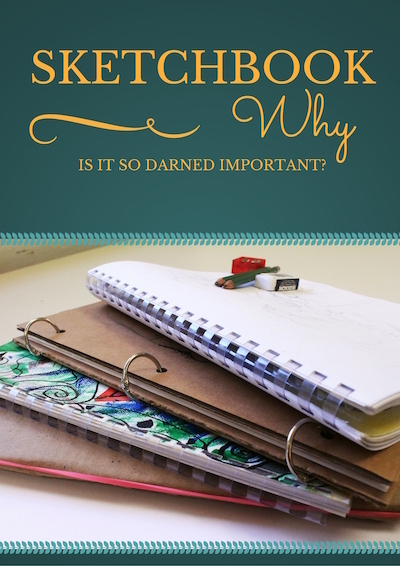 So I am wondering, if you had the perfect planner, what would be in it? The sky is the limit. Lists, calendars, sketchbook pages, anything you can think of! Below is what I have come up with so far. Feel free to try it, then come back with suggestions to make it better! The first thing that I do in my classes every year is introduce the elements of art. 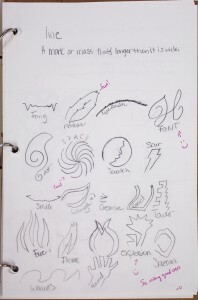 I used to have the students take notes on the elements and then do projects based on each element. However, I have found that students seem to grasp the concepts better if they are introduced to most if not all of the elements first, then be expected to use them in a project that I set out for them. Line: A line can be very expressive! Draw 20 different lines, all must look different. Once finished, go back and name each of them according to what they look like. Shape: Geometric vs organic. Divide the page into four squares. In the first two, create some kind of composition with only geometric shapes. In the last two, create a composition with only organic shapes. Value: Create a value scale. Draw a rectangle that is 1” x 7”, then divide it into 7 parts. 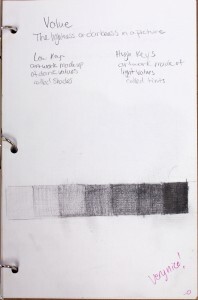 Using drawing pencils, black out the last square with the darkest pencil (6B or ebony). Then move to the 1st square and use the lightest pencil to make the lightest gray possible, moving the pencil in cross hatching marks to make the grey lineless. Then move to the other square, making each a bit darker than the previous. When finished, hold it out to arms length and make sure that each square looks different than the previous one. Texture: Use different colored crayons or colored pencils to rub textures around the room, outside, or in the hallway onto a plain white piece of typing paper. Cut these textures out and make some kind of composition on the sketchbook page. Space: Cut out magazine images that represent each of the following techniques for showing depth: overlap, diminishing size, position, and linear perspective. 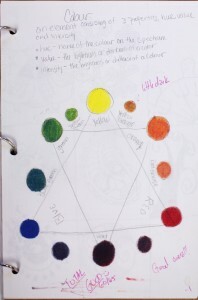 Color: Make a 12 piece color wheel using quality colored pencil that will mix well (I use Prismacolor). ONLY use the primary colors, this way students need to actually mix to find the colors. As a last hurrah to the elements unit, I have the kids create a color wheel using colored icing and Nilla wafers. It may be a little juvenile, but most students enjoy the unexpected treat in the art room! 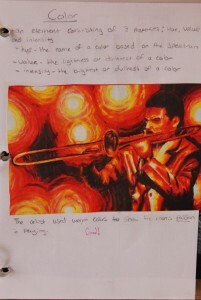 How do you teach the elements of art? Comment below! This is the one I am going to try this year. I think that it combines the pros of each of the previous designs. Give me a few months and I will tell you what I think after the kids have had a chance to try them out. You can do this or you could have your students do this part. I like to let the students do it so that they have more ownership in the project. Open the binder clips, place the cover face down to the left of each clip. Add the paper, then the backing, then close the clips. Give those students a chance to show their creativity! Add a rubber band around the cover if desired. Time. Very easy and fast to assemble. Versatile. Easy to add extra paper and worksheets. Durable. As long as the covers are nice thick cardboard or matt board. Cost Effective. It is not a major set back, but it does require the purchase of binder clips. This is the last sketchbook intractable that I am going to do at this point, if you try one out or if you have any suggestions, please comment below! 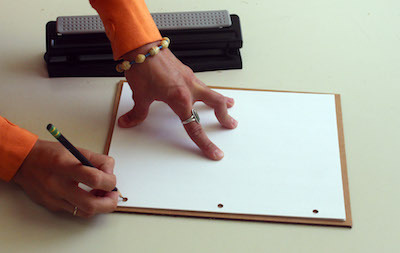 This method is also very simple, but it requires the use of a binding machine. If you have access to one, this one looks a bit more professional than the previous Rubber Band Spine Cardboard one. Plus, you can get several fun colors for the spine! Again, you can do any size you like. I just like to do it larger so that students can add paper without difficulty. 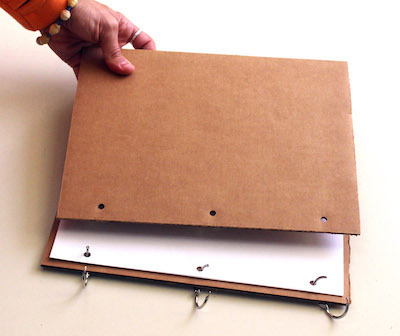 Punch holes into the sketchbook paper with the binding machine. Again, I always have the students design their sketchbook covers, but you can do it however you like. 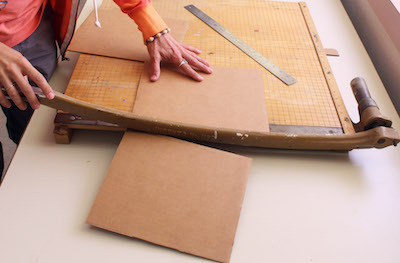 Place the cover face down into the binding machine, load sketchbook paper, lastly add the back poster board piece. Time. Easy and fast to assemble. Versatile. Easy to add extra paper or worksheets. Cost Effective. Requires a binding machine and plastic binding combs. Durability. The combs in the plastic binding tend to break after a while. There were even a couple books that had the strip break in half before the end of the year. I tried this method last year and there were many things I really liked about the book and binding. But It was a combination of the spines continually breaking on some of the students who were...less careful, and the fact that our binding machine broke that made me switch to my last design. If you try it out and let me know what you think! 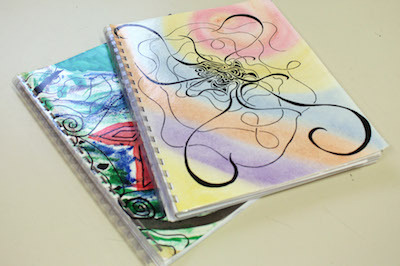 This is a very simple method for a classroom sketchbook. 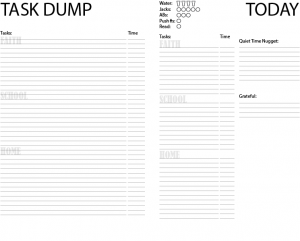 It can be any size you want, but I always made mine about the size of a regular sheet of paper because this makes it easy for students to tuck extra worksheets inside the cover. However, a caution on that, sometimes, they find this to be a handy place to keep…everything! Math assignments, permission slips from two weeks ago, gum wrappers…you name it! This one is the first method that I tried and I love it because I can make this one without purchasing anything! All the supplies are already in my cabinets. And I can pick up FREE sheets of cardboard in the SAMs isles after they finish stocking. Depending on the age of your students, you can either have all of these sheets cut before hand or you can have the students do it themselves. I teach high school, so I have always had them cut the cardboard part and provided the paper for them. This way they get to practice their ruler using skills, which sadly, I have found to be lacking in many students. 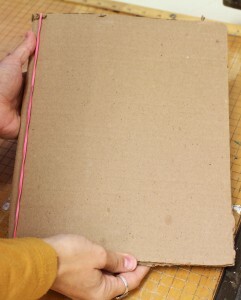 Take the cardboard and make a score mark down the middle where the spine is going to be (at 9”). Take the stack of drawing paper and fold them all in half at the same time. 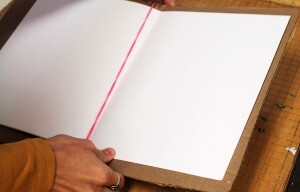 Place the paper in the middle of the cardboard and then stretch one rubber band around the spine. 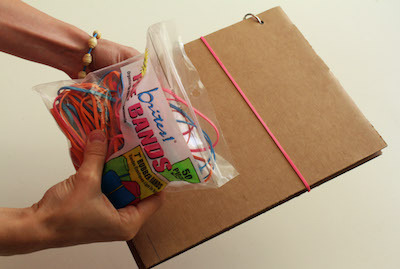 Close the book and stretch the other rubber band around the outside to keep it closed. I always have the students design their sketchbook covers. Usually I just let them do what they want with the broad instruction to make it “represent them.” However, you could give them some kind of theme to follow if you wanted to. Cost Effective. This can be made with items found in most art rooms. Durable. These puppies last all year long with the occasional rubber band replacement. Versatile. 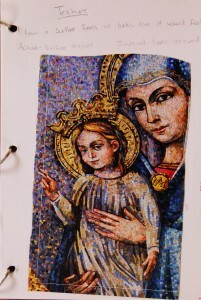 It is not easy to add pages to the sketchbook, including any worksheets that I give out. If you try this one out, I would love to hear how it went for you or if you have any suggestions! I have never required my students to buy sketchbooks for my class. It is not that I have anything against purchased sketchbooks, on the contrary, one of my favorite smells is a freshly cracked spine of a new sketchbook. However, besides the fact that I live in a semi-poor school district, I have always liked the idea of students creating their own sketchbooks. They have a sense of ownership in the process of the creation. I have some students who have kept all four sketchbooks from each year that they have been in my class. Cost Effective. This was the main reason for making them in the first place! I considered what materials would need to be bought versus items which could be found in my art room. Time. I didn’t want something that would take days and days to create. I feel that every second in the art room is valuable and I want students to be creating things in the sketchbook or in the art room more than the sketchbook itself. Durable. Just because it’s cheap doesn’t mean it can’t last the whole year! I had to consider the materials used, including the paper, in this decision. Cardboard is very good, but you could get away with a regular matt board as well. Versatile. I wanted something that could be used for a variety of classes (I teach both graphic and regular classroom art) and I wanted something that I could add paper to as we went along; ever the frugal one, I don’t like to see unused paper in a sketchbook! In the coming posts I will highlight each method. Let me know what you think in the comments below! The name of my website may be “Digital Art Teacher” but I feel that actually working with your hands is very important. Being the only art teacher of a small school, I teach graphic design, fine art, and photography. While there is definite satisfaction in creating an awesome graphic on my computer, the pride I feel in using my hands to draw or paint or make clay creations is a feeling that no mere computer mouse can give. Even if all I have time to do is sketch out a few ideas before I crack open the computer to work on something, that allows my brain to work through the ideas before the mouse hits the screen. That is what I ask my students to do as well. I feel that the sketchbook is vitally important. I have both my fine art and my graphic design class keep a sketchbook for this reason. Even if they were a complete computer junkies and only ever created digital art, I would still tell them that they need a sketchbook. It is my challenge every year to bring students to that conclusion as well. Sometimes they do, sometimes they don’t. The main thing that I have found to help students at least appreciate the sketchbook is time and repetition. I have them write down 10 different ideas of ways that they could solve the problem that I have set out for them, and then make 2 to 4 quick sketches of some of those ideas. Over time, they come to realize that their first idea is hardly ever the best idea. The other thing that I do is to keep a sketchbook myself and make it visible to my students. Again, I know how limited the teacher’s time is, but even if I only have an hour a week, 15 minutes here, 20 minutes there, it can make a difference. It also serves to fill up my creative storehouses, too. Do you keep a sketchbook? Do you have your students keep one? How do you manage the assignments you give? Comment below!